Cooling off by running through the sprinkler. It's been a hot one this week. I want one for my house.. So much fun..
What fun!! We love playing the sprinkler of here too! This is refreshing just looking at the picture! It's been a scorcher here too. Remember when we could go outside and play to have fun? Now we have to go outside before 7 a.m. or we risk a heat stroke! Yep we've been outside working and having the boys run through the sprinkler and Slip 'n Slide. It's fun! It's been very hot here too! This grandma just may have to do the same thing. 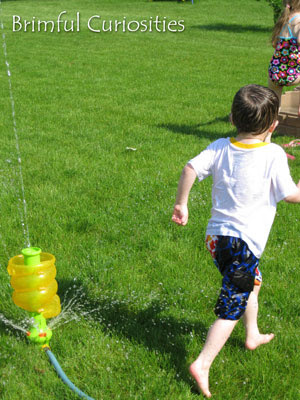 Aren't sprinklers the best! We have a couple of them, but they are MIA in the garage, so I've been spraying the kids with the hose for now. Love the screeches and smiles as the water hits them.